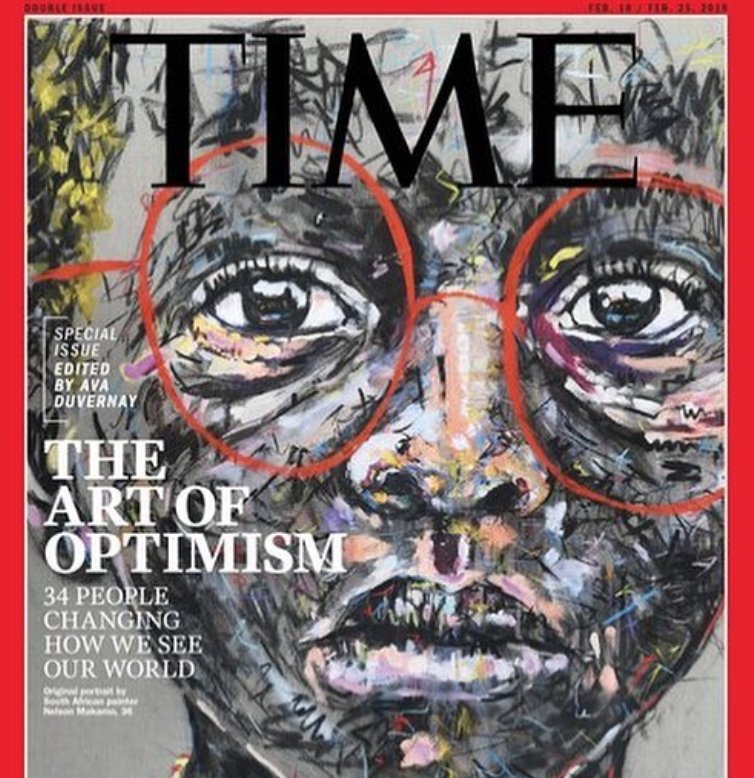 South African artist Nelson Makamo is starting 2019 with a bang - his work is gracing the cover of TIME magazine. Nelson Makamo's artwork on the cover of Tiime / Instagram. TIME magazine revealed the cover for their “Art of Optimism” issue this week. The cover is a breathtaking portrait by Limpopo-born artist, Nelson Makamo. READ ALSO: These are the new emojis arriving in 2019 - including a man in a wheel chair and underwear! "In the issue, we celebrate and suggest ways that one can find inspiration in our present moment through the work of artists who carve a path for us all. Whether a filmmaker or a photographer, an author or an actress, a poet or a painter, these pages are filled with people who use art as a weapon for dynamic optimism," said Ava DuVernay, guest-editor of TIMES’s second special issue devoted to optimism. TIME magazine shared the cover on their Instagram page, adding that "Art is worthy of our interrogation and is, in fact, an antidote for our times". The piece, an oil painting on canvas, is titled, “Vision of a limitless future”. Makamo - who is currently based in Johannesburg - was born in Modimolle, Limpopo. The 35-year-old has exhibited work at group and solo exhibitions in the USA, Netherlands, France, Italy, United Kingdom, Germany, Amsterdam, Scotland, and South Africa. According to TIME magazine, Makamo had never produced a magazine cover before. He was eager to create an image that would introduce his work to the world. He worked for three or four months on this painting. “It was the first one where I really had to force myself to say: OK this is finished now. I’m very critical,” he told the magazine.